As with the earlier discussed Chi-Lites from Chicago, the early 70's was an overflow of doo wop-based soul and R&B acts who evolved with better production, more elaborate arrangements, and on-the-nail songwriting. Like the Chi-Lites, Bloodstone came from the Midwest -- Kansas City -- and began as the doo wop group the Sinceres. in the early 60's. Toiling along for years in relative obscurity, Bloodstone actually did what the Stray Cats did nearly 10 years later, go to London to find fortune and fame. And when they came back, they came back big with "Natural High." A prototypical early 70's soul ballad, "Natural High" had a piercing falsetto lead, light as a feather background vocals, and that kind of slow jam groove made for swaying back and forth. The song begins with a striking see-saw opening with the Strat playing the lead line, an occasional bell in the background, then in drops down with the bass, stops, and then three spectacular stuttering snare and kick drum fills for an intro. Throughout the song, there are jazzy guitar runs going up the fretboard, the group whispers "I... don't... know... you," and then the song changes tempo altogether for a melodic clean Gibson solo that races all over the high register, swallowed up by that old "ahh" breathing out vocal trick into the next verse. There's also one of those "little things" that sort of watermark the song: in the verse after the first chorus, they sing: " If you have anything to do/Call me and I will do it for you/And I don't even know you." Just before he goes into the next verse, it sounds like they're whispering: "Hey Jeannie." You can definitely hear it on the "Soul Train" video below. 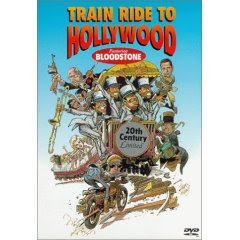 For some reason, despite having really shot their biggest load with "Natural High," Bloodstone convinced somebody two years later to finance a film starring the group, Train Ride To Hollywood. I remember the film vaguely coming out, and wondering how it actually got made and who would see it. I don't know if anybody did, but you can still get a used DVD of it from Amazon. Reading the IMDb plot description, I can understand why it wasn't exactly up there with Superfly and Shaft: "Harry Williams, member of the rhythm & blues band Bloodstone, is about to go onstage for a concert when he is hit on the head. The rest that follows is his dream. The four band members become conductors on a train filled with (impersonated) actors and characters from the 1930s such as W.C. Fields, Dracula, and Scarlett O'Hara. Patterned after movies by the Marx Brothers and the Beatles, 'Train Ride' features various songs. The thin plot requires the singing conductors to solve a mystery; Marlon Brando is murdering Nelson Eddy, Jeanette McDonald, and others by suffocating them in his armpits. Arriving in Hollywood, the Bloodstone boys are turned into wax sculptures by Brando." However, the biggest compliment for "Natural High," certifying it as ultra-cool, is that Quenin Tarantino used it prominently in his film Jackie Brown, when Robert Forster first sees the title character, played by Pam Grier (see video below). Before that video, Bloodstone performing "Natural High" on Don Cornelius' "Soul Train" TV show. I love that each guy is playing a different guitar, from the black and white Strat all the way ont he left, and then, from left to right, a gold-plated Gibson Les Paul, a Fender bass, a Fender Telecaster, and what looks like a black semi-hollow-bodied Gibson (I think). Am I imagining things when I hear the vinyl crackle on this lip-synch performance? 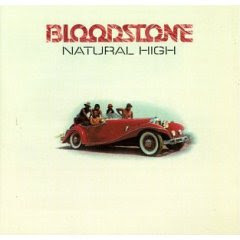 Bloodstone's Natural High is one of my all time favorites! Good post - keep it up! You cannot call Leon Russell a "one-hit wonder"! Bob Dylan never scored a #1 - the closest he came was #2: Like a Rolling Stone and Rainy Day Women. Does that make Dylan a "no-hit wonder"? Leon wrote plenty of songs that were massive hits: - "This Masquerade" done by George Benson; "Superstar" done by the Carpenters; "Delta Lady" done by Joe Cocker; "A Song for You" - Elton John; "Back to the Island" - Jimmy Buffett. Etc. Who played that lead guitar? The song came on randomly and it was like the first time hearing it. The lead guitar part grabbed me. Nice article. Looking forward to exploring the site.